FACT CHECK: Is 'Antifa' Planning a Civil War? Is ‘Antifa’ Planning a Civil War? Despite what random people might say in homemade YouTube videos, they offer no proof that any anti-fascist groups are planning even a skirmish. 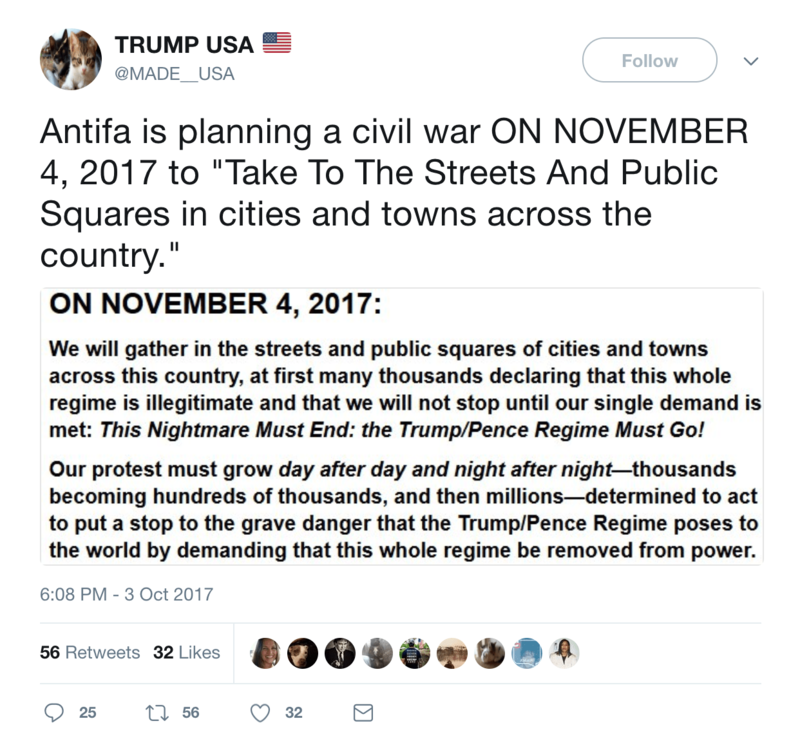 Law enforcement agents have announced that "antifa" is planning extended violent unrest or civil war beginning on 4 November 2017. Depending on the source, “antifa” (always treated as though it is one homogenous, unified group) is purportedly planning extended riots, joint violence alongside Black Lives Matter and the Black Panthers, or a coup of the American government. The rumors seem to have originated from a video originally published on 30 August 2017 by an individual named Jordan Peltz. Peltz was widely (and incorrectly) identified as a “U.S. 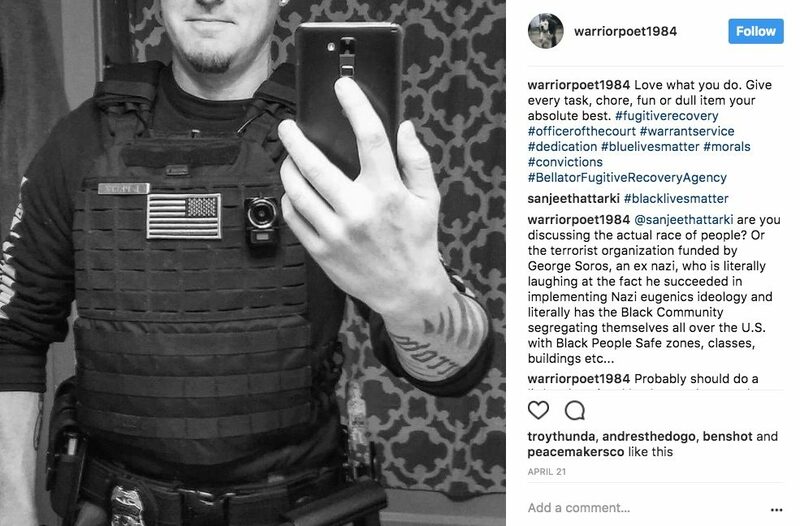 Marshal” in the video, which shows him wearing what looked like an official badge that is actually simply printed on his shirt. However, he is not actually law enforcement or military — Peltz instead evidently works as some combination of bail bondsman and bounty hunter. Their placards bore letters that spelled out “NOV 4 IT BEGINS.” But they couldn’t get enough volunteers to hold all 12 letters, so the tallest among them, the ones with the broadest wingspans, held up two letters each. The eight people weren’t enough to block the on-ramp, so some motorists were able to swerve around. [Organizer and USC film professor Perry] Hoberman says the protest was conceived in part to get the word out about a Nov. 4 demonstration the group is planning. He says it’s being modeled on the Women’s March held in January at Pershing Square and that organizers hope the action will include an encampment in a public place, à la Occupy Wall Street, or at least a prolonged series of protests over several days. A video of the protest uploaded to the group’s Facebook page has more than 700,000 views. Many of the 24,000-plus commenters ask for more information about Nov. 4. Plenty of others object to the group’s inconveniencing motorists, and some appear to endorse running them over. It is true that some groups linked to the antifa movement planned co-ordinated protests on 4 November 2017, but that had nothing to do with Peltz’s video expressing disdain for the group in August 2017, nor did he appear to have any insider law enforcement knowledge, as he does not work as law enforcement himself. When a wave of rumors about 4 November anti-fascist protests began, his clip became part of the claim as “evidence” that a “federal officer” warned of coming violence. 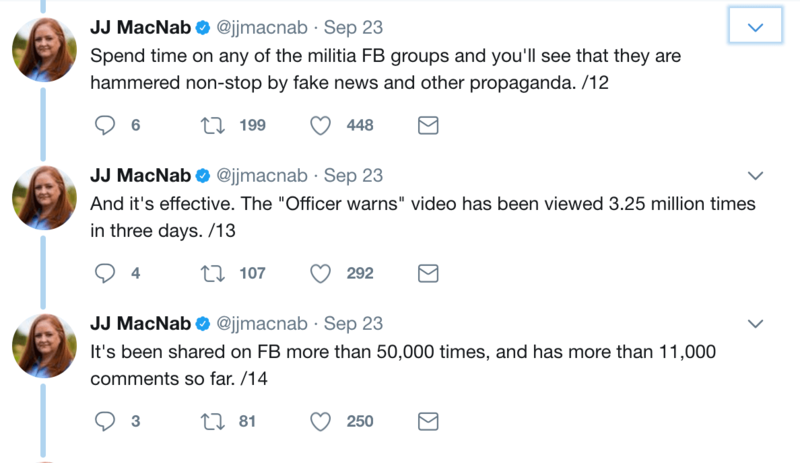 In reality, a list of apparently peaceful protests were paired with an older, unrelated video to create the impression of a looming threat. Peltz himself walked the claims far back after his video brought him unwanted attention and scrutiny. There was an uptick in the rumor’s spread on 1 November 2017, when the groups advertised the 4 November 2017 demonstrations in the New York Times. [Updated] 3 November 2017: Added information about advertisements for the planned protests which appeared on 1 November 2017 in the New York Times.